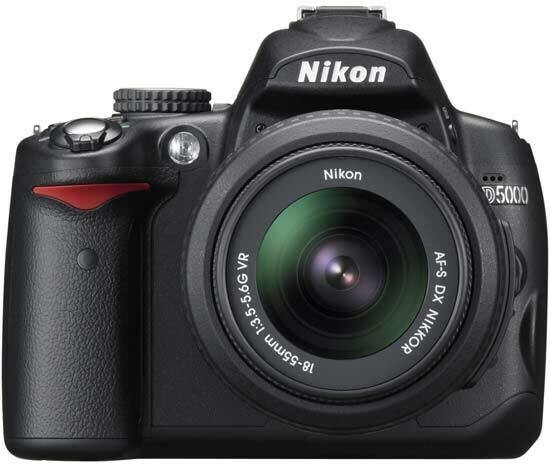 Reviews of the Nikon D5000 from around the web. The idea of an upper-entry-level DSLR (for want of a better term), that sits below the 'enthusiast' grade D90 (with its twin control dials, big battery and pentaprism viewfinder), is hardly a radical one - the Canon EOS 500D and Olympus E-620 seem to cater to a similar market. So what does this new Nikon have to offer either the tech-savvy first-time DSLR buyer, or the owner of an older entry-level model wanting newer features but unwilling to slavishly follow the manufacturer's 'upgrade path'? Nikon's already excellent digital SLR lineup gets a new member: the Nikon D5000. With the D90's 12.3-megapixel sensor, HD video capability, and a new 2.7-inch articulating LCD, the Nikon D5000 doesn't clearly displace any other cameras in the lineup, but fits between the D60 and D90 in both features and price. The Nikon D5000 is the company’s latest 'upper-entry-level' DSLR aimed at beginners or those wanting a step-up from a basic budget model. Announced in April 2009, it’s the successor to the popular D60 and while externally resembling its predecessor, it inherits many key aspects of the higher-end D90 including its sensor with Live View and HD movie recording. The D5000 also becomes the first Nikon DSLR to feature an articulated screen. As easy to use as any entry-level DSLR in auto modes, the D5000 provides greater speed, reliability and versatility plus advanced amenities. In spite of the relatively affordable price, this Nikon model employs the latest technology and its tilt/swivel LCD monitor is a definite bonus. While it may be tempting to consider a DSLR with even higher resolution, this 12.3 MP Nikon employs larger pixels for excellent dynamic range and clean images at high ISO....Overall this is a very fine camera that offers maximum value. It’s up against some still competition, but in my estimation the D5000 is the most desirable current DSLR in the sub-$700 category.